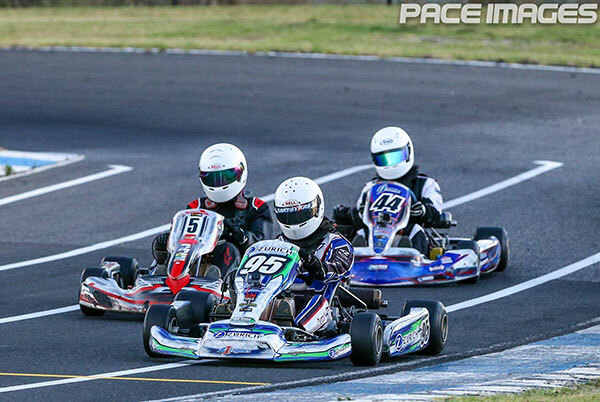 DJM Race Engineering kicked off their Victorian Country Series campaign at the opening round at the Warnambool Kart Club. With only a small crew of two drivers in former state champion Brett Jenkin and current SA state champion Josh D’Ambrosio, the team was looking to make a strong start in the series! D’Ambrosio was out first on circuit and in a big field of twenty drivers was looking to get off to a positive start after a couple of runner up round finishes at the Focus on Furniture Junior Top Guns to start the year. After a hard fought session D’Ambrosio was able to put it on pole position over the twenty kart field putting him in the best spot for Sunday’s races. Brett Jenkin was out next for his first run of the year and in a class of ten drivers Jenkin’s put in a dominate performance and was able to take pole position by two tenths and stamp his authority for Sundays racing. Team manager and owner Dylan McLellan was happy with the day but was by no means getting ahead of himself! “For both Josh and Brett to qualify on pole is a great start to the weekend but tomorrow is another day”. Sunday come round to dry racing and a sunny day and D’Ambrosio was out first and was under pressure from Johnny Hill and in a tight battle at the front between the two the SA state champion was able to take both heat wins putting him off pole position for the all important final. In another close tight battle with Johnny Hill and Maximus Fahey, D’Ambrosio was able to hold on for the win and clean sweep the opening round and take maximum points for the weekend in a polished dominate display! Brett Jenkin was next out on circuit and he had a tight battle on circuit with Michael Angwin in heat 1! After a tight battle and a close finish Jenkin took heat 1 by under two tenths! In heat 2 Jenkins was able to take a strong win and cruise three seconds up the road from Joel Macpherson and Michael Angwin putting him in the box seat for the Sunday afternoon final! Final underway and Jenkins was again able to open abit of margin and scamper just under two seconds up the road to take out the final, clean sweeping the weekend and taking maximum points for the weekend! After a perfect weekend DJM Race Engineering manager and owner Dylan McLellan couldn’t be happier! “What a day! Some days go karting can be a tough game but when you work hard all the time and you get two clean sweeps it makes it all worth it! What a job by Brett to start his season in such dominate way and after Josh going so close at top guns this a massive result for the team!” DJM Race Engineering will be at the track this weekend at Ipswich for the opening round of the Australian Kart Championship while also having drivers compete at Bendigo in the opening round of the Golden Power Series!